On Friday, September 21st, an iconic, annual event took place at High School East. It was Homecoming. While this annual game is usually held on a Saturday, this year, the varsity football game was played on a Friday after the pep rally. Kickoff was at 3:30, and the stands were filled with Hills East students and staff supporting their Thunderbirds. The opponent was Copiague, and both teams were coming into the game with a record of 0-2. The game started in the right direction for the Thunderbirds, as they scored a touchdown on their opening drive. Junior Nyrel Sevilla ran it in from the 2-yard line for 6 points with 9:14 left in the opening quarter. However, Copiague would respond immediately, as right after the score they returned the kick for a 99-yard touchdown to take a 7-6 lead with 8:59 left. The game remained 7-6 until minutes into the second quarter, when Copiague was punting out of their own end zone. The punt was bobbled, and the kicker decided to kick it out of the end zone, which resulted in a safety. Only a minute or so later, Sevilla got his second rushing touchdown of the game, and after a 2-point conversion, the score was 16-7 Hills East. Then the game really got out of hand, as the Thunderbirds completely dominated from that point on. The T-Birds scored 38 unanswered points to make it 44-7!! All those on the sideline and all of the fans in the stands were having a great time, and they were enjoying what they knew would surely be a Homecoming game win. After two garbage-time touchdowns, the final score was 44-21, in favor of the home team. Nyrell Sevilla was the player and story of the game, as he ended with 3 touchdowns and 2 interceptions. He also had a really huge block when the game was close that led to a major first down, but that’s something you can’t see in the stats. Quarterback Brett Martin had himself a great game as well, and it was an overall team victory. 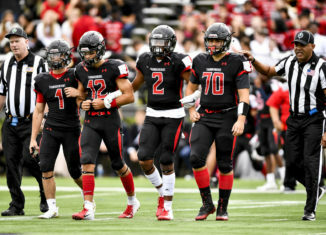 With this win, Hills East improved to 1-2 on the young season. There’s still a lot left of this season, so come on out and support your Varsity T-Birds as they work their way through a competitive schedule. 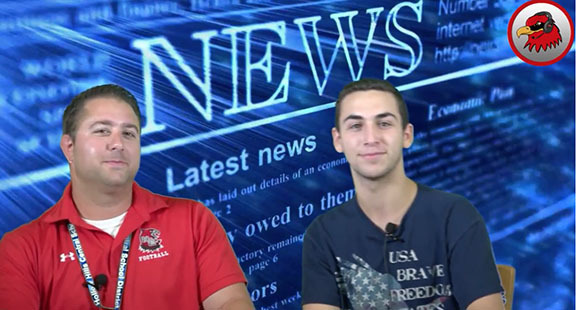 Click to the right to see the interview between Coach T. and Noah Epstein.